Bournemouth Borough Council: Darryl Howells (with the assistance of Jess Glover) has won two significant (for the client) appeals this week. Both relate to the same site, but would have had varying consequences if either one had been lost. Our client had carried out development without the benefit of planning permission consisting of the excavation of soil, construction of retaining walls and the lowering of ground levels to form a parking area. All within the grounds of a block of flats, but importantly close to protected trees. 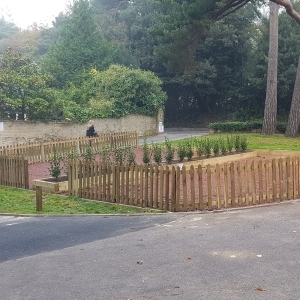 As a result of the unauthorised works, Bournemouth Borough Council served an Enforcement Notice against the property alleging harm to the visual amenity of the locality and damage to the trees. The requirements of the notice would have required our client to reinstate all the ground back to its original condition, and if harm had occurred to the trees, then potential court proceedings could follow. The majority of Enforcement Notices have a 28 day lead in time to appeal so the client acted swiftly and sought planning advice from Pure Town Planning. We advised appealing the decision within those 28 days to protect his position. Once done, Darryl advised the appellant to erect a picket fence around the area, and apply for retrospective permission for the creation of a landscaped amenity space. Despite our support the application was refused by the Council so Darryl appealed that decision too. At both appeals, Darryl successfully argued that the works that had been carried out actually improved the visual amenities of the area, and represented a betterment to the situation before the works had occurred. Using the original arboricultural report that accompanied the planning application, Darryl successfully argued that there was no evidence of harm to the protected trees, and their contribution to the area would continue. Finally Darryl argued that the requirements of the Enforcement Notice were excessive and if the Inspector were minded to uphold the Notice, lesser remediation works could be carried out. No such scenario was required as the Planning Inspector granted retrospective planning permission for the works carried out, and quashed the Enforcement Notice in full. If you find yourself being threatened by a Local Planning Authority for any works that you have carried out, with or without the knowledge that you needed planning permission it is critical to get professional advice. Please get in touch with a Pure Town Planning consultant, who in complete confidence will advise of the best cause of action and arguments to convert a negative into a positive.